Last Monday, my boyfriend and I had been planning on going to the German Market in Birmingham, however at the last moment we decided against it and chose to go to the cinema instead. We liked the look of two of the films showing: The Hunger Games Mockingjay Part I and Ouija. While I am a fan of the Hunger Games (I have read all of the books and own the first two films on DVD/Blu-ray), I was a little disappointed at Catching Fire and fancied watching a good horror so we chose to go and see Ouija instead. I actually quite liked the premise of the story, even if it was slightly predictable in places. The story follows a young girl named Laine whose best friend Debbie recently died after using a Ouija board. Laine and her friends use the Ouija board to try and come to terms with Debbie’s death but end up contacting an evil spirit instead. As I said, there are parts of the plotline that are fairly predictable but generally I quite liked it. The characters were likeable. Again, there was a little bit of predictability in terms of who would die and when but overall, they were good, likeable characters. Another positive point for me was that there were a few good scares. I am a bit of a pansy when it comes to watching horror films, especially when watching them at the cinema with the dark and loud atmosphere, but I still enjoy watching them. 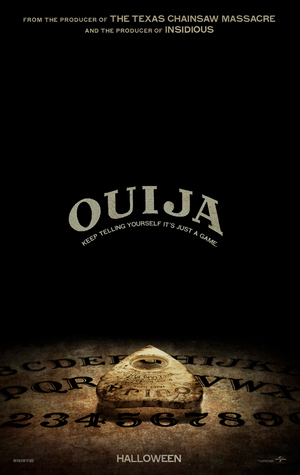 Watching Ouija provided me with some decent thrills every now and again! Although the characters were likeable, I didn’t find them very realistic, specifically because of their ages. When the film started, I was unsure of how old they were supposed to be since they were mature enough to either be in college or have already graduated from college, however they were still living at home and clearly weren’t enrolled in college/didn’t have full-time jobs. As the film progressed, I realised they were still in high school, which didn’t suit their mature personalities and plotline and thus made their ages seem quite unrealistic. The climax was awful. The film actually contained two climaxes which isn’t a bad thing, but both my boyfriend and I thought that they were very short and quite anti-climatic. It was as though the film had been building up to this big event that would occur and would be terrifying to the audience but when the climax happened, it was over in a flash without inducing much fear so it was all very disappointing. There were parts of the film that neither my boyfriend or I feel were explained very well at all, including why you’re not supposed to play alone or at a graveyard, why Debbie was shown later in the film and also Doris’s sister, who appeared briefly and spoke about the promises Doris had made to her though these were never explained. The ending was also incredibly anti-climactic. It ends with one of the characters looking through the planchette of the board. And that is it. There is no hook or anything to leave us on the edge of our seats. Since they mention earlier in the film that you can see spirits through the planchette, I had thought we would see Debbie smiling back at the character to let them know she was looking out for them, or even one of the evil spirits, which would provide one final scare. But there was nothing. The film just ended, leaving me to feel as though they had shot one final clip but had forgotten to put it in or something. While the film isn’t bad, it definitely seems to be more of a teen film than a young adult/mature film. While I enjoyed watching it, I definitely didn’t feel as though it was worth the money we had paid to see it at the cinema but would be more suited for us to watch when it eventually comes on Netflix. Overall, I kind of wish we had seen the Hunger Games instead as that would have been more value for money but it isn’t the worst film I have seen at the cinema! Have you seen Ouija? What did you think?